The role of interleukin-22 (IL-22) in intracellular bacterial infections is a controversial issue, although the contribution of this cytokine to host defense against extracellular bacterial pathogens has been well established. In this study, we focused on an intracellular bacterium, Chlamydia, and evaluated the production and function of IL-22 in host defense against chlamydial lung infection using a mouse model. We found that Chlamydia muridarum infection elicited quick IL-22 responses in the lung, which increased during infection and were reduced when bacterial loads decreased. More importantly, blockade of endogenous IL-22 using neutralizing anti-IL-22 monoclonal antibodies (mAb) resulted in more severe disease in the mice, leading to significantly higher weight loss and bacterial growth and much more severe pathological changes than treatment with isotype control antibody. Immunological analyses identified significantly lower T helper 1 (Th1) and Th17 responses in the IL-22-neutralized mice. In contrast, intranasal administration of exogenous IL-22 significantly enhanced protection following chlamydial lung infection, which was associated with a significant increase of Th17 response. The data demonstrate that IL-22 is a critical cytokine, mediating host defense against chlamydial lung infection and coordinating the function of distinct Th-cell subsets, particularly Th1 and Th17, in the process. 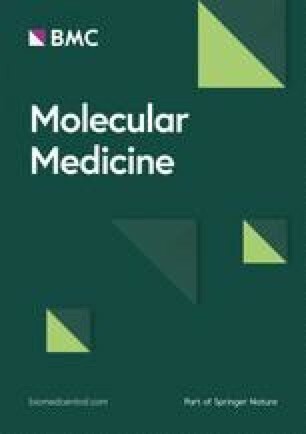 Supplementary material is available for this article at https://doi.org/10.2119/molmed.2013.00115 and is accessible for authorized users. As a member of the interleukin-10 (IL-10) family, IL-22 is an important cytokine for modulating inflammatory responses (1). IL-22 can be produced by innate and adaptive immune cell populations, most notably T helper 17 (Th17) cells, and γβ T cells, natural killer T cells (NKT cells), lymphoid tissue inducer (LTi) cells, and LTi-like cells (2,3). IL-22 targets to various tissues, including the lung, gut, skin, liver, pancreas and kidney, for biological function (4, 5, 6). The reported biological functions of IL-22 include upregulation of antimicrobial proteins and enhancement of regeneration and innate immunity (4, 5, 6). Recent studies have demonstrated that IL-22 is involved in host defense against infections caused by various bacteria, fungi, viruses and parasites (7, 8, 9, 10, 11). For bacterial infection, it is generally accepted that IL-22 plays a protective role in extracellular bacterial infections, such as Citrobactor rodentium (6), Klebsiella pneumoniae (7) and segmented filamentous bacterium (SFB) (12), but its role in intracellular bacterial infections remains largely unclear. In the limited studies on intracellular bacterial infections, IL-22 was found redundant for Francisella tularensis (13) and Listeria monocytogenes (14) infections, although its role in Mycobacterium tuberculosis infection appeared inconsistent (15,16). Chlamydiae are obligate intracellular bacterial pathogens, causing multiple human diseases. In particular, Chlamydia trachomatis and Chlamydia pneumonia are responsible for various human diseases in different organs. C. pneumoniae causes respiratory diseases such as bronchitis, sinusitis and pneumonia, while C. trachomatis is a major cause of ocular and genital tract sexually transmitted diseases (17). Chlamydia muridarum (Cm), a mouse strain of Chlamydiae, has been widely used in mouse models of respiratory and genital tract infections (18). Studies in clinical settings and using mouse models have demonstrated the critical importance of type 1 T-cell immunity characterized by interferon-γ (IFN-γ) production in controlling chlamydial infection (19, 20, 21). Recent studies by us and others have indicated that IL-17/Th17 also plays an important role in host defense against chlamydial lung infection (22, 23, 24, 25). In particular, IL-17 can promote Th1 responses in chlamydial lung infection and work synergistically with Th1 for inhibiting chlamydial growth (22, 23, 24, 25). Therefore, the codevelopment of sufficient Th1- and Th17-cell immune responses is important for the host to effectively control the infection and reduce pathologic damages. Both IL-22 and IL-17 can be produced by Th17 cells, and there are data to suggest that IL-17 and IL-22 can cooperate in host defense against extracellular bacterial infections. Jha et al. have shown spontaneous release of IL-22 and IL-17 in cervical washes of women with C. trachomatis infection (26). Based on the importance of the Th17 response in host defense against chlamydial infection and the nature of Chlamydia as an intracellular bacterial pathogen, we evaluated, in the present study, the role of IL-22 in this well-established mouse lung infection model. We examined the kinetics of the IL-22 response in local tissue following Cm lung infection and specifically tested the role of IL-22 in host defense against the infection by neutralization and supplementation of this cytokine in the lung. We found that IL-22 production increased quickly following intranasal infection and reduced when bacterial loads decreased. The neutralization of IL-22 showed significant detrimental effects on the host. We found much more severe disease, indicated by higher body weight loss, bacterial growth and more severe pathological damage, in the IL-22-neutralized mice compared with the isotype control antibody sham-treated mice, results that were associated with downregulation of Th1 and Th17 cell responses. Moreover, administration of exogenous IL-22 enhanced protection and increased IL-17/Th17 responses. The data suggest that IL-22 plays an important role in host defense against chlamydial lung infection through modulating the pattern of T-cell responses. Male C57BL/6 mice (6–8 wks old) were purchased from the University of Manitoba animal care facility. The mice were hosted at a pathogen-free laminar flow cabinet. All animal experiments were conducted in compliance with the guidelines issued by the Canadian Council for Animal Care, and the research protocol was approved by the Protocol Management and Review Committee of the University of Manitoba. C. muridarum organisms (Nigg strain) were cultured, purified, and quantified as previously described (27). Briefly, C. muridarum was grown in HeLa 229 cells in RPMI 1640 medium supplemented with 10% fetal bovine serum (FBS), 1% L-glutamine, and 25 mg/mL gentamycin, and the elementary bodies (EBs) were purified by discontinuous density gradient centrifugation. The infectivity of purified EBs was measured by infecting Hela 229 and immunostaining of chlamydial inclusions. The purified EBs were suspended in sucrose-phosphate-glutamic acid (SPG) buffer and stored at −80°C. The same batch of purified EBs was used throughout this study. Mice were intranasally inoculated with 1 × 103 inclusion-forming units (IFU) of C. muridarum EBs in 40 µL SPG buffer, and the same volume of SPG buffer was administrated for the sham-inoculated group. For IL-22 blockade experiments, mice were intranasally administered 10 µL (40 µL) of either rat IgG2a anti-mouse IL-22 monoclonal antibody (mAb) (catalog number 16-7222; eBioscience, San Diego, CA, USA) or rat IgG2a isotype control (catalog number 16-4321; eBioscience) at 1 d before, the same day, and every 2 d after the intranasal infection. For application of exogenous IL-22, each mouse was intranasally given 0.2µg mouse recombinant IL-22 (carrier free) (catalog number 582-ML/CF; R&D Systems, Minneapolis, MN, USA) in 30 µL sterile phosphate-buffered solution (PBS) using the same interventional strategy as in the IL-22-blockade experiments. The control mice were sham treated with an equal volume of sterile PBS. Mice were sacrificed at d 7, d 12 and d 21 postinfection. Lung tissues were removed and homogenized in 3 mL SPG buffer. After centrifugation to clear residual debris, the homogenates were used to measure live chlamydial organisms and cytokines (IL-17, IL-22 and IFN-γ) as previously described (28). The lung tissues of mice were perfused with PBS and fixed in 10% formalin. The tissue sections were routinely stained with hematoxylin and eosin (H&E) and examined under light microscopy as described (25,29). The degree of lung inflammation was scored using a semiquantitative grading system (25); grading scale: 0, normal; 1, mild and limited inflammation, granuloma formation, cellular infiltration in less than 25% of area, no obvious infiltration into adjacent alveolar septae or air space; 2, mild interstitial pneumonitis, diffused cellular infiltration in some area (25%–50%), septal congestion, interstitial edema; 3, inflammatory cell infiltration into perivascular, peribronchiolar, alveolar septae, and air space (50%–75% of area); 4, over 75% of area of lung filled with infiltrating cells. Lung, spleen and draining lymph node (LN) cells were isolated for bulk culture and flow cytometry analysis as described (30,31). Briefly, lung tissues were harvested from the animals at specified times and digested in 2 mg/mL collagenase XI (Sigma-Aldrich, Oakville, Ontario, Canada) in RPMI 1640 for 1 h at 37°C. After digestion, 35% (volume/volume) Percoll (Pharmacia, Uppsala, Sweden) and ammonium-chloride-potassium (ACK) lysis buffer (150 mmol/L NH4Cl, 10 mmol/L KHCO3 and 0.1 mmol/L EDTA) were used to remove tissue debris and red blood cells (RBC), respectively. For spleen single-cell preparation, spleens were cut into small pieces and digested in 2 mg/mL collagenase D (Roche Diagnostics, Meylan, France) in RPMI 1640 for 30 min at 37°C. The cell suspension was filtered and RBCs were removed by ACK lysis buffer. For draining LN mononuclear cell isolation, the draining LNs were homogenized in 3 mL RPMI 1640 and RBCs were removed by ACK lysis buffer. All of the cells were washed and resuspended in complete RPMI-1640 medium (RPMI-1640 supplemented with 10% FBS, 1% L-glutamine, 25 mg/mL gentamicin and 0.05 mmol/L 2-mercaptoethanol). Single-cell suspensions were cultured in 48-well plates at a concentration of 7.5 × 106 (spleen) and 5 × 106 (lung and LN) cells/well with or without UV-inactivated Cm (1 × 105 IFU/mL). The supernatants were collected from the cell cultures after 3 d and assayed for IL-10, IFN-γ, IL-12p40, IL-6, IL-17 and transforming growth factor-β (TGF-β) by enzyme-linked immunosorbent assay (ELISA) using antibodies purchased from eBioscience or BD Biosciences. The intracellular IFN-γ-, IL-17- and IL-10-produced T cells were analyzed by intracellular cytokine staining as described previously (29). Briefly, the cells were stimulated with phorbol myfismte acetate (PMA; 50 ng/mL) and Ionomycin (1 µg/mL), and incubated at 37°C in complete RPMI 1640 medium. After 2 h, brefeldin A was added to the culture, and the cells were cultured for another 4 h to allow cytokine accumulation intracellularly. The cells were collected and blocked with anti-CD16/CD32 Abs in fluorescence-activated cell sorter (FACS) buffer for 20 min and then surface stained with anti-CD3ε-fluorescein isothiocyanate (FITC) and anti-CD4− phycoerythrin (PE) mAbs (eBioscience). After being fixed and washed in permeabilization buffer, cells were stained with anti-IFNγ-allophycocyanin, anti-IL-17-allophycocyanin and anti-IL-10-allophycocyanin mAbs (eBioscience) or with corresponding isotype control Abs for 30 min. Cells were washed twice with permeabilization buffer and analyzed by flow cytometry. All of the sample data were collected using an LSR II flow cytometer (BD Biosciences, San Diego, CA, USA) and analyzed using FACS Express software (De Novo Software, Los Angeles, CA, USA). Total RNA of lung tissues was extracted by using TRIzol reagent according to the manufacturer’s instructions (Invitrogen/Life Technologies, Burlington, ON, Canada). A constant amount of RNA (1.5 µg per sample) was reverse transcribed into cDNA, and the cDNA was then amplified using murine-specific primers. Primer sequences were as follows: IL-22 (167 bp), forward: 5′-GACAGGTTCCAGCCCTA CAT-3′, reverse: 5′-ATCGCCTTGATCTCT CCACT-3′; IL-17 (399 bp), forward: 5′-GGTCAACCTCAAAGTCTTTAACTC-3′, reverse: 5′-TTAAAAATGCAAGTA AGTTTGCTG-3′; IFN-γ (405 bp), forward: 5′-TACTGCCACGGCACAGTCAT TGAA-3′, reverse: 5′-GCAGCGACTC CTTTTCCGCTTCCT-3′; T-bet (438 bp), forward: 5′-TGAAGCCCACACTCC TACCC-3′, reverse: 5′-GCGGCATTTT CTCAGTTGGG-3′; retinoic acid-related orphan receptor γt (RORγt) (582 bp), forward: 5′-GCGGAGCAGACACAC TTACA-3′, reverse: 5′-TTGGCAAACT CCACCACATA-3′; glyceraldehyde-3-phosphate dehydrogenase (GAPDH) (191 bp): forward: 5′-AACGACCCCT TCATTGAC-3′, reverse: 5′-CACGA CTCATACAGCACCT-3′. Polymerase chain reaction (PCR) reaction mixtures were loaded onto a 1.5% agarose gel containing ethidium bromide, and the bands were analyzed for density on Quantity One software (Bio-Rad Laboratories, Hercules, CA, USA). Statistical analysis of the data was performed using analysis of variance (ANOVA) and t tests (GraphPad Prism software, version 5.0 [GraphPad Software, La Jolla, CA, USA]), and values of p < 0.05 were considered significant. Data are presented as mean ± standard deviation (SD). The presented data were collected from all four mice of each group. All the experiments were repeated two to three times with similar results. We first analyzed the kinetics of IL-22 responses following Cm lung infection by measuring IL-22 mRNA expression and protein level. The expression of IL-17 and IFN-γ messages were also measured at the same time points and in the same tissues. As shown in Figure 1A, the mRNA expression of IL-22 in the lung increased quickly following intranasal Cm infection, becoming detectable at d 1, peaking at d 5–9, and decreasing at d 12. The kinetics of the IL-22 response was quite similar to the kinetics of IL-17 and IFN-γ expression, although the latter two appeared to have dropped less at d 12. There were no detectable IL-22 and IL-17 messages in the lung in naïve mice (d 0). The trend of IL-22, IL-17 and IFN-γ protein levels is consistent with that of mRNA expression (Figures 1B–D). The kinetics of the IL-17 response was consistent with our report in lung Cm infection (22). In general, the results demonstrate that Cm lung infection induces a quick IL-22 response, suggesting that it might be involved in host defense against the infection. The mRNA and protein levels of IL-22, IL-17 and IFN-γ in the lung tissues following intranasal Cm infection. C57BL/6 mice were inoculated intranasally with Cm (1 × 103 IFU) and were sacrificed at the indicated days. (A) Total RNA was extracted from the lung tissues and IL-22, IL-17 and IFN-γ mRNA expression was assayed by RT-PCR using specific primers, as described in Materials and Methods. (B-D) The protein levels of IL-22, IL-17 and IFN-γ in lung homogenate were assayed by ELISA. Two independent experiments (four mice in each group in each experiment) are shown as mean ± SD. p.i., Postinfection. 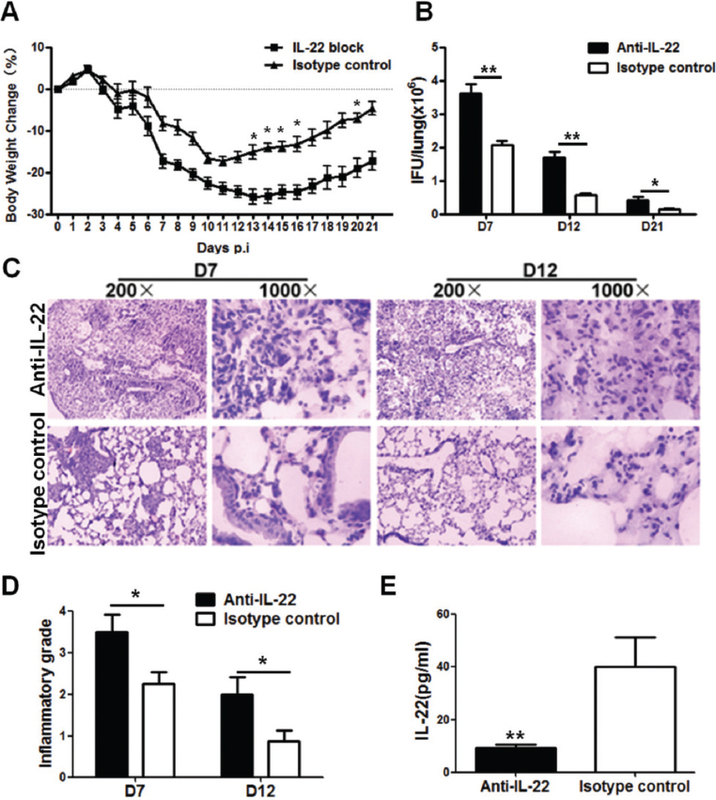 To directly assess whether IL-22 contributes to the host defense against Cm infection in the lung, anti-mouse IL-22 mAb was used to neutralize endogenous IL-22 at the site of infection (lung). The results showed that the mice in the IL-22-neutralized group suffered more serious diseases than the group treated with isotype control antibody following the infection (Figure 2). Specifically, the IL-22-neutralized mice showed more severe body weight loss and less recovery at d 21 following infection when the mice were killed (Figure 2A). In addition, the IL-22-neutralized mice showed significantly higher bacterial loads (IFU) in the lung at both early (d 7) and late (d 12 and d 21) stages of infection (Figure 2B). Histological analysis showed more severe tissue damage and pathological changes in IL-22-neutralized mice at the earlier (d 7) and later (d 12) days of infection. 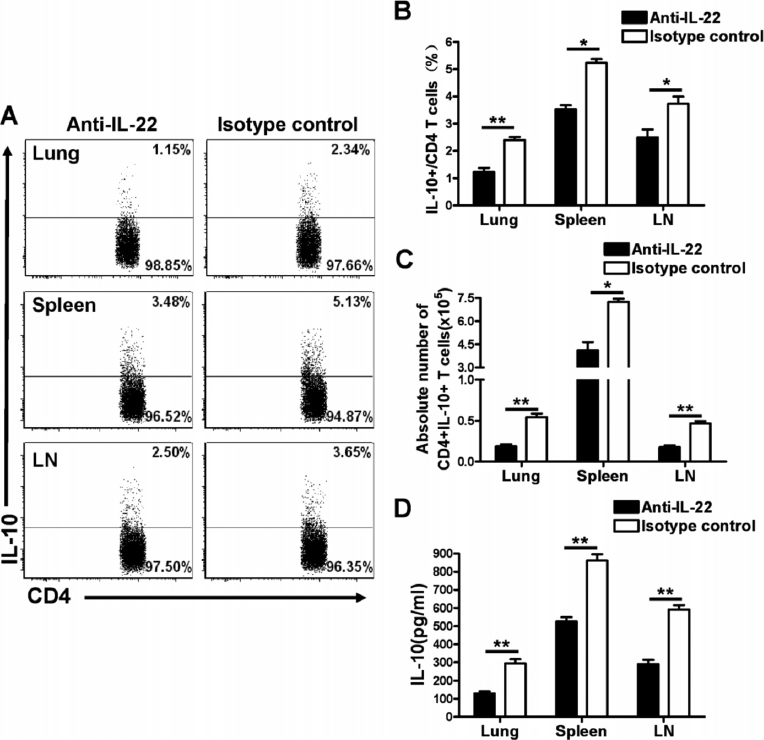 The lung tissues of anti-IL-22-treated mice showed much broader areas of consolidation and extensive cellular infiltration with inflammatory cells than the isotype control group (Figures 2C, D). The ratio of neutrophil infiltration was, however, lower in anti-IL-22-treated mice than isotype control-treated mice, as we saw in anti-IL-17-treated mice (22). 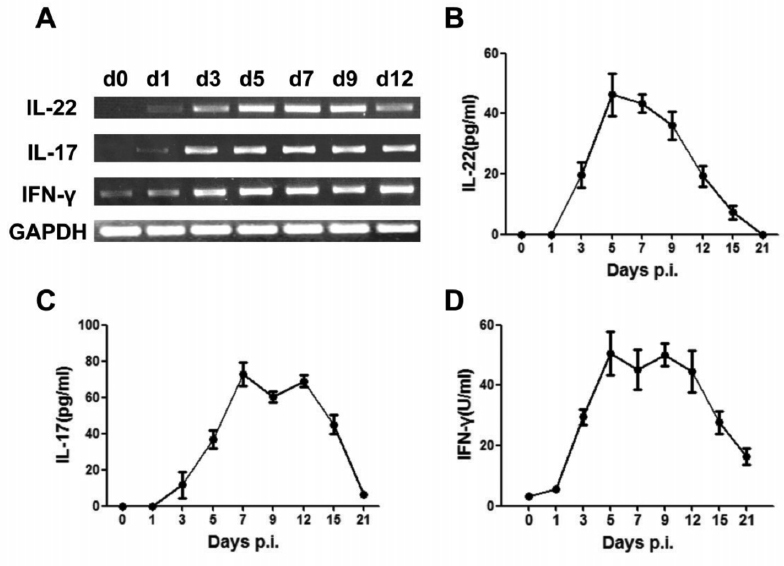 The heavier inflammation of anti-IL-22-treated mice was in a similar pattern as that in anti-IL-17-treated mice (22) and was consistent with higher bacterial burdens in the mice (Figure 2), suggesting that the persistence of infection may keep stimulating the infiltration of inflammatory cells. As a confirmation, the IL-22 levels in the anti-IL-22-treated mice were significantly lower than those in isotype control-treated mice (Figure 2E). Overall, the data demonstrate that IL-22 played an important protective role in host defense against chlamydial lung infection. IL-22-neutralized mice show more severe diseases than isotype control antibody-treated mice following lung Cm infection. C57BL/6 mice were intranasally administered with 10 µg of either anti-mouse IL-22 mAb or isotype control antibody at 1 d before and the same day of infection, followed by every 2 d thereafter. Mice were inoculated intranasally with 1 × 103 IFU of Cm EBs. (A) The percentage of body weight changes in the two groups of mice. Asterisks (*) on isotype control line indicate statistical significance of the anti-IL-22 group versus isotype control at the same day point. (B) Mice were sacrificed at d 7, d 12 and d 21 postinfection. Lung tissues were then removed and measured for live chlamydial loads. (C) The lung tissue sections from different experiment groups were routinely stained with H&E and examined with light microscopy (D) Semiquantitative analysis of lung inflammation. Slides were examined by a blinded pathologist and the inflammatory grades were analyzed as described in Materials and Methods. (E) At d 7, the lung homogenates were collected and the IL-22 level detected by ELISA. The IL-22 antibody treatment did effectively reduce the IL-22 levels in the lung of infected mice. The results are shown as mean ± SD. One of three experiments (four mice in each group in each experiment) with similar results is shown (*p < 0.05; **p < 0.01). p.i., Postinfection. Reduction of IL-17/Th17 responses in IL-22-neutralized mice following Cm lung infection. (A) Mice were treated as described in Figure 2. The lung, spleen and draining LN cells isolated at d 7 postinfection were analyzed for cytokine production by intracellular cytokine staining, as described in Materials and Methods. (B, C) Flow cytometry data were summarized to show the percentage (B) and absolute number (C) of IL-17+ CD4+ T cells in the different organs. (D) Total RNA extracted from the lung tissue was assayed for RORγt mRNA expression by RT-PCR using specific primers, as described in Materials and Methods. (E) The relative gene expression of RORγt to housekeeping gene (GAPDH) was performed on Quantity One software. (F-H) Lung, spleen and draining LN cells were isolated and cultured with stimulation of UV-inactivated Cm EBs for 72 h and the cytokine (IL-17, IL-6 and TGF-β) levels in culture supernatants were determined by ELISA. At least three independent experiments with four mice in each group were performed, and one representative experiment is shown. Data show the mean ± SD (*p < 0.05; **p < 0.01). Our and others’ previous works have demonstrated that IL-17 plays a protective role in host defense against chlamydial lung infection (22, 23, 24, 25). There is also evidence suggesting that IL-17 and IL-22 cooperate in host defense against some infections (32). Considering that Th17 cells can produce both IL-22 and IL-17, along with the similar kinetics of IL-22 and IL-17 responses in the lung following Cm infection (Figure 1), we hypothesized that IL-22 may influence the IL-17 response in the process. We therefore directly tested Th17 responses and related transcription factor expression as well as cytokines in the IL-22-neutralized and sham-treated (isotype control) mice following Cm infection (d-7 postinfection). 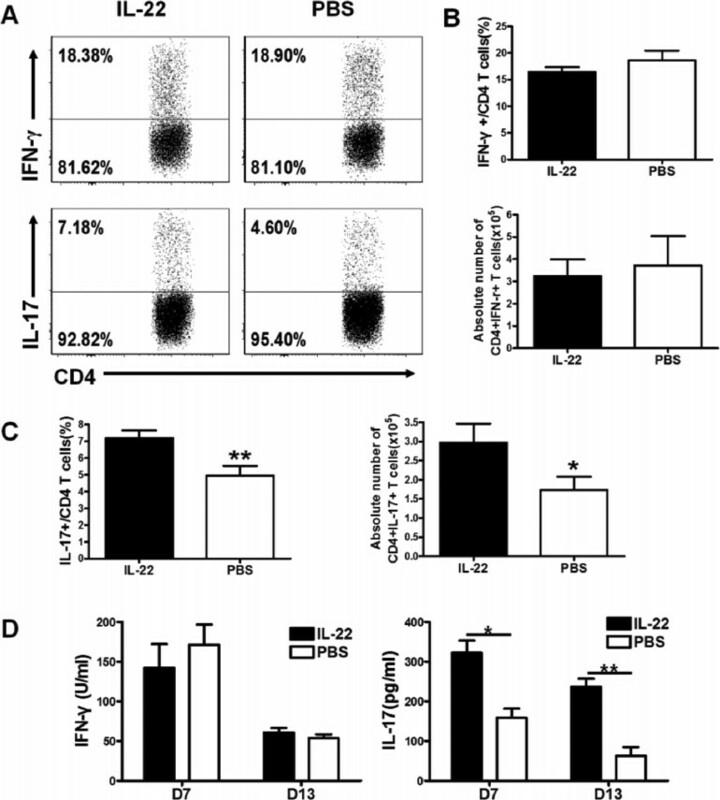 Intracellular cytokine staining showed marked reduction of IL-17-producing CD4+ T cells in the lung, spleen and draining LNs of the IL-22-neutralized mice (Figures 3A-C). 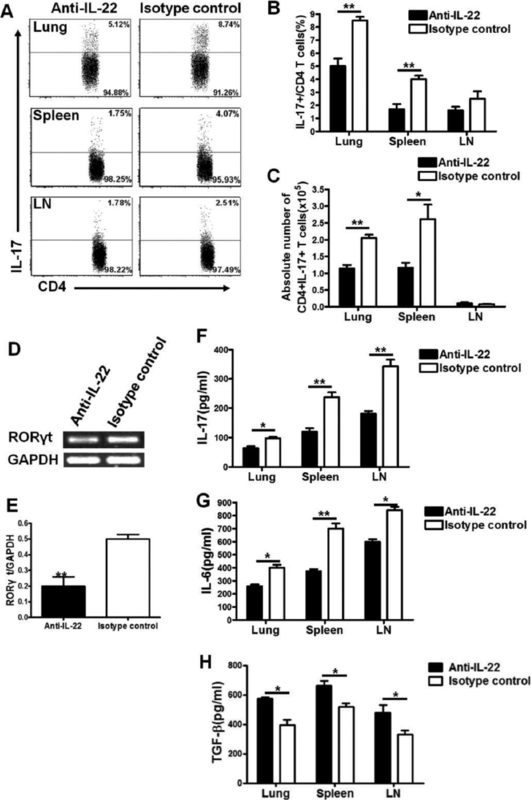 Analysis of mRNA expression of RORγt, the specific transcription factor controlling Th17 cell differentiation, showed significantly lower expression of this factor in the lung tissues of IL-22-neutralized mice (Figures 3D, E). At the protein level, we found that lung, spleen and draining LN cells isolated from IL-22-neutralized mice produced significantly lower levels of IL-17/Th17-promoting cytokine (IL-6) and higher levels of TGF-β than isotype control mice (Figures 3F-H). These data suggest that IL-22 can promote the production of IL-17 and the development and/or expansion of Th17 cells during chlamydial lung infection. Previous studies have demonstrated that Th1 responses play a critical role in host defense against chlamydial lung infections (20,33). In addition, we have demonstrated a promoting role of IL-17 in IFN-γ response in Cm infection (22). Since the above-described data (Figure 4) showed reduction of IL-17 by IL-22 neutralization, we further compared the Cm-driven Th1 response in the lung, spleen and draining LN cells of the IL-22-neutralized mice with the isotype control mice. The level of Th1 (IFN-γ+ CD4+ CD3ε+) cells in the lung, spleen and draining LNs from each group at d 7 postinfection were analyzed by flow cytometry. As shown in Figures 4A-C, the frequency and absolute number of Th1 cells in IL-22-neutralized mice were significantly lower than those in the isotype control mice. The mRNA expression of T-bet (the transcription factor controlling Th1 cell differentiation) was significantly lower in the lung tissues of IL-22-neutralized mice than the isotype control mice (Figures 4D, E). ELISA analyses also showed marked reduction of IFN-γ and IL-12 (Th1-promoting cytokine) in these organs of the IL-22-neutralized mice (Figures 4F, G). As a control, the treatment of sham-inoculated mice with ant-IL-22 or isotype control antibody has no negative effect on mouse body weight. These mice showed very low levels of IL-17- and IFN-γ-producing CD4+ T cells and there was no significant difference between the groups (Supplementary Figure S1). In addition, although anti-IL-22 antibody treatment also reduced IL-17 and IFN-γ in the Cm-infected mice at d 3 postinfection, as shown the measurement of lung homogenates, the intracellular cytokine staining failed to show differences in the production of these cytokines by CD4+ T cells (Supplementary Figure S2), suggesting that the treatment of anti-IL-22 can also reduce IL-17 and IFN-γ production by cells other than CD4 T cells in the very early stage of infection. In general, the results of cytokine studies indicated that IL-22 can enhance Th1 and Th17 CD4+ T-cell responses as well as the production of IL-17 and IFN-γ by innate immune cells. Reduced IFN-γ/Th1 responses in IL-22-neutralized mice following Cm lung infection. C57BL/6 mice (four mice per group) were treated with anti-IL-22 antibodies or isotype control antibodies and sacrificed at d 7 after Cm infection. (A) Representative flow cytometry graphs showing staining of IFN-γ-producing CD4+ T cells of each group. (B, C) Summary of flow cytometry analysis to show the percentage and absolute number of IFN-γ+ CD4+ T cells. (D) Total RNA extracted from the lung tissue was assayed for T-bet mRNA expression by RT-PCR using specific primers. (E) The relative gene expression of T-bet to housekeeping gene (GAPDH). (F, G) Lung, spleen and draining LN cells were isolated and cultured with UV-inactivated Cm EBs for 72 h. The concentrations of IFN-γ and IL-12p40 protein in the culture supernatants were measured by ELISA. One representative experiment of three independent experiments (four mice in each group in each experiment) with similar results is shown. Data are shown as the mean ± SD (*p < 0.05; **p < 0.01). IL-10 is an immune regulatory cytokine in infectious and inflammatory diseases. Its inhibitory roles in Th1 and Th17 responses have been well documented. In addition, previous studies have shown a detrimental role of IL-10 in chlamydial infections (20,30). After observing the lower Th1/Th17 responses in IL-22-neutralized mice, we wanted to know if there was a higher IL-10 response in these mice, which might be the reason for the reduction of Th1/Th17. We therefore examined the impact of IL-22 neutralization on IL-10 production in this Cm lung infection model. We found that IL-10-producing CD4+ T cells were significantly lower (in both percentage and absolute number) in the IL-22-neutralized mice than in the isotype control mice (Figures 5A-C). At the protein level, ELISA analyses also showed significantly reduced production of IL-10 (Figure 5D). The data suggest that the more serious diseases and lower Th1/Th17 responses observed in IL-22-neutralized mice are not attributable to IL-10 production. IL-22-neutralized mice show less IL-10 production following Cm lung infection. C57BL/6 mice were treated and infected as described in Figure 2. Lung, spleen and draining LN cells were analyzed at d 7 postinfection. (A) Representative flow cytometry graphs of IL-10-producing CD4+ T cells in the lung, spleen and draining LN of the different groups. (B, C) Summary of percentage and absolute number of IL-10+ CD4+ T cells in each group. (D) Lung, spleen and draining LN cells were isolated and cultured with UV-inactivated Cm EBs, IL-10 levels in 72-h culture supernatants were determined by ELISA. Results are representative of three independent experiments (four mice in each group in each experiment). Data are shown as the mean ± SD (*p < 0.05; **p < 0.01). To confirm the protective role of IL-22 in the host defense against chlamydial lung infection, we used an alternative approach by local administration of exogenous recombinant IL-22 during the infection. We treated the C57BL/6 mice with mouse recombinant IL-22 following Cm lung infection and examined the effect of this treatment on the infection process. Control mice were treated with vehicle solution (PBS). As shown in Figure 6, the mice that received mouse recombinant IL-22 exhibited much milder body weight loss and quicker recovery (Figure 6A) as well as significantly lower bacterial loads (Figure 6B) than the control mice treated with PBS. 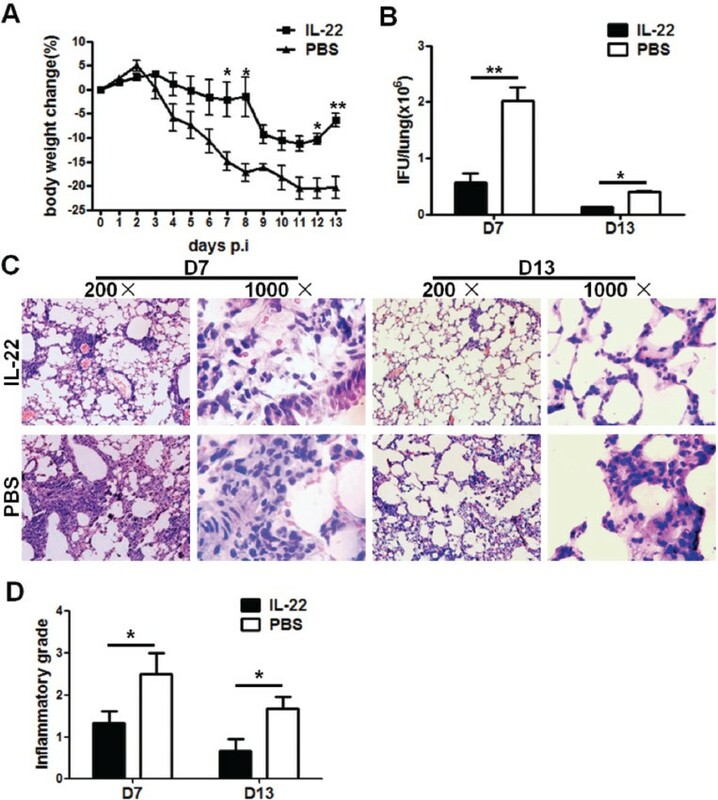 In particular, at both early (d 7) and later (d 13) phases of the infection, IL-22-treated mice showed significantly lower bacterial loads in the lung (Figure 6B). Consistently, lung histological analysis showed that the IL-22-supplemented group exhibited milder tissue damage and inflammation compared with the PBS-treated group at d 7 and d 13. In a word, these data confirm that IL-22 plays a protective role in Cm lung infection. Administration of exogenous IL-22 led to better protection following Cm lung infection. C57BL/6 mice were treated with recombinant IL-22 (carrier free in PBS) or vehicle buffer (sterile PBS) at 1 d before, the same day of and every 2 d after the intranasal infection, as described in Materials and Methods. (A) Body weight changes in the different groups following lung Cm infection. Asterisks (*) on isotype control line indicate statistical significance of anti-IL-22 group versus isotype control at the same time point. (B) Chlamydial loads in lung at d 7 and d 13 postinfection. (C) The lung tissue sections from each group were routinely stained with H&E and observed under light microscopy. (D) Semiquantitative analysis of lung inflammation. Slides were examined by a blinded pathologist and the inflammatory grades were analyzed as described in Materials and Methods. Three independent experiments with four mice in each group were performed, and one representative experiment is shown. Data are expressed as mean ± SD (*p < 0.05; **p < 0.01). p.i., Postinfection. To explore the mechanism by which exogenous IL-22 enhances protection, we further examined the effect of IL-22 administration on Th1 and Th17 responses in Cm lung infection. We first analyzed Th1 (IFN-γ+ CD4+ CD3ε+) cells and Th17 (IL-17+ CD4+ CD3ε+) cells in the lung in the IL-22- and PBS-treated mice using flow cytometry. As shown in Figures 7A, B, the frequency and absolute number of Th1 cells in the IL-22-treated mice were similar to those in the sham-treated mice. In contrast, the neutralization of IL-22 significantly increased the frequency and absolute number of Th17 cells (Figure 7C). Further analysis of the population levels of Th1 and Th17 cells by bulk culture of isolated lung mononuclear cells also showed significant increases of IL-17, but not IFN-γ, production in IL-22-treated mice at both earlier (d 7) and later (d 13) stages of infection (Figure 7D). The data imply that IL-22 might have a more direct enhancing effect on the Th17 response, but may be not or much less effective for directly promoting Th1 responses. The administration of exogenous IL-22-enhanced Th17 responses following lung Cm infection. Mice were treated and infected as described in Figure 7. Mice were killed at d 7 postinfection. (A) Representative flow cytometry images showing IFN-γ-producing CD4+ T cells and IL-17-producing CD4+ T cells from each group in the lung. (B, C) Summary of the percentage and absolute number of IFN-γ+ CD4+T cells (B) and IL-17+ CD4+ T cells (C) in the lung of the different groups. (D) IFN-γ and IL-17 levels in 72-h culture supernatants of the lung cells with the stimulation of UV-inactivated EBs were determined by ELISA. Results are representative of three independent experiments (four mice in each group in each experiment). Data are shown as the mean ± SD (*p < 0.05; **p < 0.01). In this study, by working on a mouse model, we have shown that IL-22 plays an important role in host defense against respiratory tract infection of Chlamydia, an intracellular bacterium. The protective role of IL-22 in this infection is mainly through enhancing Th17 and Th1 immunity. This conclusion is generated form the following major findings in the study. First, we found that Cm lung infection induced quick IL-22 responses (within 24 h) in the local tissues, which peaked and then reduced during the course of infection. Second, we found that the neutralization of local IL-22 in vivo using anti-IL-22 mAb at the time of Cm infection led to more serious diseases (larger body weight loss, higher bacterial loads and more severe tissue pathology in the lung), which was associated with decreased Th17 and Th1 responses in the local tissues and draining LNs, as well as secondary lymphoid organ (spleen). Furthermore, we found that supplement of exogenous recombinant IL-22 significantly enhanced protection during lung infection, which was associated with increased Th17 responses. Aujla and colleagues found that exogenous IL-22 promoted epithelial repair and reduced the bacterial load in mice infected with Klebsiella pneumonia (7). The report was consistent with what we have observed in the present study in a Cm lung infection model. It should be noted that the administration of rIL-22 in this study is only a proof-of-concept experiment, which confirms the involvement of IL-22 in host defense against chlamydial infection. The therapeutic potential of this cytokine, if any, in chlamydial diseases is yet to be tested by comprehensive study. Overall, the data suggest an important role of IL-22 in coordinating Th17/Th1 reduring an intracellular bacterial lung infection and ultimately controlling the infection. The use of both blockade and supplement approaches in the study is helpful for understanding the effect of IL-22 on distinct T-cell subsets during the infection. The neutralization experiments showed reduction of both Th1 and Th17 responses, which may suggest that IL-22 promotes both cells directly. However, the supplement experiment showed that the administration of exogenous recombinant IL-22 enhanced IL-17/Th17 responses, but not Th1 response. The data suggest that the reduced Th1 response observed in the neutralization experiments is more likely a result of reduced Th17 responses in the IL-22-blocked mice. Indeed, we have reported that IL-17 can promote Th1 responses in chlamydial lung infection through modulating dendritic cell function, particularly for IL-12 production by dendritic cells (22). The mechanism for the promoting effect of IL-22 on IL-17 may be related to multiple factors but its effect on IL-17-promoting cytokines could be one of the major reasons. We found that blockade of IL-22 caused significant reduction of IL-6 but increase of TGF-β production following Cm lung infection. Recent research has demonstrated that IL-6 and TGF-β play important roles in regulating the balance between Th17 cells and regulatory T cells (Treg) (34). Although TGF-β is needed for the development of both Treg and Th17 responses because of its inducing effect on both RORγt and Foxp3 expression (35), IL-6 is a critical cytokine determining Th17 response. Under the conditions of sufficient TGF-β production, high levels of IL-6 can remove the inhibition of Foxp3 on RORγt, and thus switch the response from Treg to Th17. The cytokine pattern change (reduced IL-6 production with increased TGF-β production) in IL-22 neutralized mice is more suitable for the development of Treg rather than Th17 cells (34, 35, 36). Consistently, we found significantly increased CD4+ CD25+ Foxp3+ T cells and surface TGF-β expressing CD4+ cells in the IL-22-neutralized mice, indicating enhanced Treg populations (data not shown). In line with the inhibitory effect of IL-22 on Treg responses, the observed promoting effect of it on Th1 response is possibly through indirectly enhancing Th17 and inhibiting Treg. Although our focus in the present study is mainly on the production of these cytokines by CD4+ T cells at d 7 and later times of infection, the effect of IL-22 on IL-17 and IFN-γ production appears not only through influencing CD4+ T cells. As shown in Figure 1, these cytokines started to increase at earlier times, including d 3 postinfection. At this early time point, we found that anti-IL-22 treatment significantly reduced the levels of these cytokines in the lung homogenates; however, the measurement of intracellular cytokine staining of CD4+ T cells failed to show differences between the two groups (Supplementary Figure S2). The data suggest that IL-22 also influences IL-17 and IFN-γ production by nonclassical T cells, particularly in the early point of infection. These non-classical cells are likely to include yôT cells, NKT cells and others. The reason for the failure to show influence of exogenous IL-22 on the Th1 response in the supplement experiments is probably because a sufficient amount of endogenous IL-22 already existed in the normal (sham-treated) mice, which can generate enough IL-17 to promote Th1 and inhibit Treg. Therefore, the observed better protection in the exogenous IL-22 treated mice is more likely due to the higher IL-17 production caused by the treatment, which synergizes with IFN-γ to inhibit chlamydial growth. However, the potential direct promoting effect of IL-22 on the Th1 response still cannot be completely excluded because IL-22 may be needed for the background or normal levels of IFN-γ production, although the excessive levels of IFN-γ may not need IL-22. This is possible, especially considering that IL-22 is produced by different types of immune cells, particularly including Th1 cells. Notably, in the mouse system, the IL-22 gene was mapped on chromosome 10, the same region as the IFN-γ (37). Thus, the alternation in the expression of IL-22 might influence the regulation of IFN-γ gene expression. In this study, IL-22-neutralized mice exhibited significantly lower levels of IL-10 production than sham-treated mice. In addition, the IL-10–producing CD4+ T cells in the different organs were also significantly reduced in the IL-22-neutralized mice. This contradicts our initial prediction that the Th1/Th17 reduction in IL-22–neutralized mice may be accompanied by high IL-10 production, which has been shown to be inhibitory for Th1/Th17 responses. However, the findings may reflect the complement effect between IL-10 and IL-22. The receptor for IL-22 is composed of IL-22R1 and IL-10R2 (38). IL-10R2 is also a component of the receptor complex for IL-10 (IL-10R1/IL-10R2) (38). The early signal transduction pathways, such as activation of signal transducers and activators of transcription (STAT1)/STAT3 and the subsequent induction of mRNA for suppressor of cytokine signaling 3 (SOCS3), are similar between IL-22 and IL-10, likely because of the common usage of IL-10R2 receptor by both cytokines (39). Therefore, IL-22 and IL-10 are closely linked in the inflammatory reactions. Nagalakshmi et al. found that the IL-22 response had a positive correlationin with the IL-10 response in intestinal inflammation, showing that neutralization of IL-22 significantly reduced IL-10 production (40). That report was consistent with what we have observed in the present study in the Cm lung infection model. The finding of lower IL-10 production in the IL-22–neutralized mice further confirms the direct promoting effect of Th1/Th17 responses. In addition, the data suggest that, although lower IL-10 has been found to be associated with better protection in chlamydial lung infection (20), lower IL-10 alone is not sufficient for protection. In contrast, higher Th1 and Th17 responses are critical for protection. In summary, our data show that IL-22 is a critical cytokine in determining the development and/or expansion of distinct T cell subsets, including Th1 and Th17, during respiratory tract infection by Chlamydia. The study provides new evidence supporting the importance of IL-22 in intracellular bacterial infection. The demonstration of the critical role of IL-22 in enhancing protective Th17/Th1 responses may have implications in the development and improvement of preventive and therapeutic approaches for chlamydial diseases. This work was supported by grants from the Canadian Institutes of Health Research to X Yang (CCI92213 and CIHR/RPA-124955) and grants from the National Natural Sciences Foundation of China (#30811120425 and #81271853) to W Zhao. Y Peng was a recipient of a PhD Studentship for Overseas Study from Shandong University. Supplementary material, approximately 556 KB.